Received November 3, 2017; Revised November 30, 2017; Accepted December 4, 2017. Chinese artichoke (Stachys sieboldii Miq.) belongs to herbaceous perennial plants of Labiatea and is cultivated as edible and medicinal crops in China, Japan and Korea. A Chinese artichoke plant showing virus-like symptoms was collected in Chungju, Korea. Plant sap of the sample was inoculated in Nicotiana tabacum cv. Xanthi-nc, Chenopodium quinoa and Chenopodium amaranticolor. Necrotic local lesions were observed in the inoculated leaves of N. tabacum cv. Xanthi-nc and C. amaranticolor, C. quinoa with systemic chlorotic spots and mosaic symptoms on the upper leaves. The disease reactions on indicator plants suggested that the collected Chinese artichoke sample was mixed-infected with different viruses. We detected three viruses by RT-PCR analysis using genus- and species-specific primer sets for Alfalfa mosaic virus (AMV), Cucumber mosaic virus (CMV) and Tobacco mosaic virus (TMV). This study is the first report of a mixed infection of three viruses in Chinese artichoke in Korea. Alfalfa mosaic virus (AMV)는 Bromoviridae 과, Alfamovirus 속에 속하며, 세계적으로 광범위하게 분포되어 있다. 넓은 기주 범위를 가지며 즙액 및 종자에 의한 전염과 진딧물에 의한 전염이 가능한 것으로 알려져 있다(Mueller와 Grau, 2007; Hiruki와 Hampton, 1990). Cucumber mosaic virus (CMV)는 Bromoviridae 과, Cucumovirus 속에 속하는 식물바이러스로, 100과 1,200여종 이상의 넓은 기주 범위를 가지며 염기서열과 혈청학적 반응 차이에 따라 subgroup IA, subgroup IB 그리고 subgroup II로 분류되고 있다(Choi 등, 1990; Douine 등, 1979; Kaper와 Waterworth, 1981; Owen과 Palukaitis, 1998; Palukaitis와 Garcia-Arenal, 2003). 또한 CMV는 즙액 및 종자에 의한 전염과 75종의 진딧물에 의해 비영속적으로 전반된다(Francki 등, 1979). 지난 5년(2007년부터 2011년까지)간의 통계학적 결과에 따르면, CMV가 국내 농작물에 미치는 경제적 피해가 매우 큰 것으로 보고되었다(Kim 등, 2012). Tobacco mosaic virus (TMV)는 Virgaviridae 과, Tobamovirus 속에 속하는 식물바이러스이다. 두꺼운 외피단백질을 가지고 있어 물리적 안정성이 높고, 종자전염과 토양전염이 가능하며, 특히 즙액 및 접촉에 의한 전염성이 매우 높은 바이러스로 알려져 있다(Broadbent, 1965; Hollings와 Huttinga, 1976; Taylor 등, 1961). 초석잠(Stachys sieboldii Miq. )은 꿀풀과(Labiatea)의 여러해살이풀에 속하며 중국, 일본, 및 러시아 등에서 식용 및 약용 작물로 재배되고 있다. 초석잠의 뿌리와 잎을 달여서 식수대용으로 복용하면 간경화, 지방간, 뇌경색, 동맥경화, 노인성 치매의 예방 및 치료, 기억력 증진에 효과가 있는 것으로 알려져 있다(Back 등, 2004). 국내에는 중국과 일본에서 유입된 품종이 자생하고 있으며 최근 초석잠의 효능이 알려지면서 재배면적이 증가하고 있다. 국내에서는 현재까지 초석잠에 감염하는 바이러스가 보고되지 않았고, 초석잠의 바이러스병에 대한 정보 또한 부족한 실정이다. 국외의 경우, Potyvirus 속에 속하는 초석잠모자이크바이러스(Chinese artichoke mosaic virus, ChAMV)와 Tobamovirus 속의 담배모자이크바이러스(Tobacco mosaic virus, TMV), Alfamovirus 속의 알팔파 모자이크바이러스(Alfalfa mosaic virus, AMV)가 초석잠에 감염하는 것으로 보고되어 있다(Lirong 등, 1986; Fuji 등, 2003). 본 연구에서는 최근(2016-2017년) 충북 충주에서모자이크 병징을 보이는 초석잠에서 바이러스를 분리하여 TMV, AMV 및 CMV를 동정하였다. 2016년과 2017년 충북 충주에서 바이러스에 감염된 것으로 추정되는 초석잠을 채집하였다(Fig. 1). 모자이크 병징을 보이는 초석잠 잎 100 mg과 0.01 M 인산완충액(Phosphate buffer, pH7.2) 1 ml을 멸균한 막자사발로 마쇄하여 Nicotiana benthamiana, N. tabacum cv. Xanthi-nc, Chenopodium quinoa, C. amaranticolor에 즙액 접종하였다. 접종일로부터 3일째 N. tabacum cv. Xanthi-nc의 접종엽에서 TMV의 특징적인 병징인 괴사반점이 관찰되었고, C. amaranticolor의 접종엽에는 CMV의 특징적인 병징인 괴사반점이 관찰되었다. 또한 접종일로부터 7일째 C. quinoa의 상엽에서 AMV의 특징적인 병징인 퇴록반점이 관찰되었다(Fig. 2). 이 결과로부터 초석잠에 나타난 병징은 여러 바이러스(TMV, CMV, AMV)의 복합감염에 의한 것으로 추정되었다. Symptoms on the leaves of a Chinese artichoke plant. (A) Chinese artichoke showing mosaic symptoms. (B) Mosaic symptoms on upper leaves. The symptomatic leaf samples were collected from Chungju in 2016. 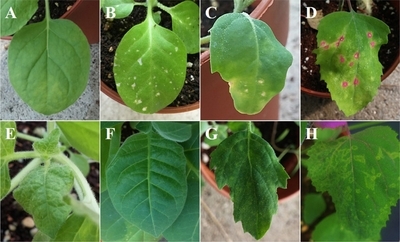 Symptoms on the leaves of indicator plants induced by mechanical sap-inoculation. Photographs were taken at 14 days post inoculation (dpi). Necrotic local lesions on the inoculated leaves of N. benthamiana (A), N. tabacum cv. Xanthi-nc (B), C. quinoa (C) and C. amaranticolor (D). Mosaic symptoms on the upper leaves of N. benthamiana (E) and N. tabacum cv. Xanthi-nc (F) and C. quinoa (G). C. amaranticolor was induced chlorotic spots on the upper leaves (H). 바이러스 감염 여부를 확인하기 위해 모자이크 병징을 보이는 N. benthamiana 상엽으로부터 Plant RNA PrepKit (BIO CUBE, Suwon, Korea)를 이용하여 Total RNA를 추출하였다. 기주식물 반응 결과로부터 추정되는 바이러스와 기존에 알려진 초석잠 감염바이러스에 대한 degenerate primers (Table 1)를 제작하였다. Tobamovirus와 Cucumovirus 진단 프라이머의 경우 외피 단백질을 포함하고, Ilarvirus-degenerate primer의 경우 1a 단백질의 일부를 증폭할 수 있도록 설계하였다. 제작된 프라이머를 사용하여 Reverse Transcription-Polymerase Chain Reaction(RT-PCR)을 실시한 결과, Potyvirus를 제외한 Cucumovirus, Ilarvirus, Tobamovirus 진단 프라이머에서 positive control과 동일한 크기의 증폭산물을 확인할 수 있었다(Fig. 3A). 각각의 PCR 산물을 클로닝하여 염기서열분석(Macrogen)을 한 결과, Ilarvirus-degenerate primer에 의해 증폭산물의 경우, AMV와 유사성을 보였다. Alfamovirus와 Ilarvirus는 Bromoviridae에 속하는 바이러스로 AMV의 1a 단백질 일부가 상동성이 있어 증폭된 것으로 추정되었다. 또한 각 바이러스의 외피 단백질에 대한 specific primer를 제작하여 RT-PCR을 수행한 결과, 채집한 초석잠에서 3종의 바이러스(CMV, AMV, TMV)가 복합 감염되어 있음을 확인할 수 있었다(Table 1, Fig. 3B). 위의 초석잠에서 분리한 3종의 바이러스를 CMV-Cha, AMV-Cha 및 TMV-Cha로 명명하였다. Agarose gel electrophoresis analysis of the PCR products obtained using degenerate primers (A) and specific primers (B). (A) M: 100 bp, Lane 1: Cucumovirus (950 bp), Lane 2: Ilarvirus (390 bp), Lane 3: Potyvirus (700 bp), Lane4: Tobamovirus (800 bp), Lane 5: Healthy, N: Negative control, P: Positive control. (B) M: 100 bp, Lane 1: CMV (1,050 bp), Lane 2: AMV-CP (670 bp), Lane 3: TMV-CP (480 bp), Lane 4: healthy, N: negative control, P: positive control. I: Inosine, Y: C/T, R: A/G, D: G/A/T, M: A/C, N: A/C/G/T, W: A/T, K: T/G. 염기서열이 결정된 각 바이러스의 외피 단백질을 생물정보센터(NCBI)를 이용하여 BLAST 분석을 실시한 결과, TMV-Cha는 기존에 보고된 담배에서 분리된 Zehenfeng 분리주(HE818459)와 97%, AMV-Cha는 콩에서 분리된 Joe Davis 분리주(HQ185569)와 99%의 유사도를 나타냈다. CMV-Cha는 국내 고추에서 분리된 RP20 분리주(KC527749)와 98%의 유사도를 보였다. 국내외에서 CMV가 초석잠에 감염한다는 보고는 아직까지 없었으며, 기존에 초석잠에 감염하는 것으로 보고된 AMV와 TMV, 그리고 이번 연구를 통해 새로 분리된 CMV-Cha의 외피단백질 서열을 바탕으로 계통 분석을 실시한 결과, 기존에 보고된 바이러스들과 유연관계가 높은 것을 확인할 수 있었다(Fig. 4). Phylogenetic analysis of each coat protein gene of CMV (A), AMV (B) and TMV (C) isolated from Chinese artichoke. The phylogenetic tree was reconstructed by the maximum likelihoods test using Mega 7 program with 1,000 bootstrap replication. The number at each branch shows bootstrap value. GenBank accession numbers; Fny (D10538), Mf (AJ27648), Y (D12499), Nt9 (D28780), SD (AB008777), Tfn (Y16926), LS (AF127976), Q (M21464), S (U37227), PSV (JN135292), 425 Madison (K02703), KR2 (AF294433), Lst (FN667967), 195AN (AJ130705), Ca616 (DQ314756), Lyh1 (AJ130709), Dac16 (AJ130708), Ca616 (DQ314756), VRU (AF015716), TSV (AF400664), TMV-152 (AF395129), Bacgiang (AM412008), K3 (AJ310339), YN (AJ239099), LCGM (KC572633), KMAN (KC572627), TOM (AF103779), SD1 (DQ014551), THN1 (LN651240), PMMoV (KY288633). 따라서 초석잠에 혼합 감염한 바이러스의 분리를 통해 국내 초석잠에도 TMV와 AMV가 감염하고 있으며 CMV 또한 새로운 기주로서 초석잠에 감염할 수 있다는 것을 확인할 수 있었다. 향후 이들 바이러스 분리주에 대한 특성을 파악하고자 한다. 2016년 충북 충주에서 모자이크 병징을 보이는 초석잠을 채집하였다. 담배와 명아주에 즙액접종을 실시한 결과 담배에서 접종엽에 괴사반점이 나타나고 명아주 2종에서 상엽에 퇴록반점을 동반한 모자이크 병징이 관찰되었다. 기주반응과 결과를 통해 여러 바이러스의 복합감염을 추정할 수 있었고, 추정되는 바이러스의 확인을 위해 속특이 및 종특이 프라이머를 이용하여 RT-PCR을 수행하여 3종의 바이러스(AMV, CMV, TMV)를 검정하였다. 본 연구는 국내 초석잠에서 3종의 바이러스 감염을 확인하였고 CMV의 감염에 대한 첫 보고이다. This study was carried out with the support of Cooperative Research Program for Agricultural Science & Technology Development (Project No. PJ012266012017) in Rural Development Administration, Republic of Korea and 2016 Research Grant from Kangwon National University. Back H. S, Na Y. S, Kim D. H, Lee C. H, Lyu B. H, and Song S. K. (2004) Antioxidant activities of Stachys sieboldii MIQ roots. J. Life Sci 14, 1-7. Broadbent L. (1965) The epidemiology of tomato mosaic. Ann. Appl. Biol 56, 177-205. Choi J. K, Kwon S. B, Lee S. Y, and Park W. M. (1990) Some properties of two isolates of Cucumber mosaic virus isolated from Aster yomena Makino and Commelina communis L. Korean J. Plant Pathol 6, 138-143. Choi S. K, Choi J. K, Park W. M, and Ryu K. H. (1999) RT-PCR detection and identification of three species of cucumoviruses with a genus-specific single pair of primers. J. Virol. Methods 83, 67-73. Douine L, Quiot J. B, Marchoux G, and Archange P. (1979) Recensement des espèces végétales sensibles au Virus de la Mosaïque du Concombre (CMV) Etude bibliographique. Ann. Phytopathol 11, 439-475. Francki R. I. B, Mossop D. W, and Hatta T. (1979) Cucumber mosaic virus. In: CMI/AAB Descriptions of Plant Viruses , 213. Fuji S, Yamamoto H, Furuya H, and Naito H. (2003) Characterization of a new potyvirus isolated from Chinese artichoke in Japan. Arch. Virol 148, 2249-2255. Hollings M, and Huttinga H. (1976) Tomato mosaic virus. In: CMI/ AAB Descriptions of plant viruses , 156. Hiruki C, and Hampton R. O. (1990) Diseases caused by viruses and viruses infectious to alfalfa. In: Compendium of Alfalfa Diseases , 51-58. Kaper J. M, and Waterworth H. E. (1981) Cucummoviruses. In: Handbook of Plant Virus Infections: Comparative Diagnosis . Kim J. S, Lee S. H, Choi H. S, Kim M. K, Kwak H. R, Kim J. S, and Choi G. S. (2012) 2007-2011 characteristics of plant virus infections on crop samples submitted from agricultural places. Res. Plant Dis 18, 277-289. Letschert B, Adam G, Lesemann D. E, Willingmann P, and Heinze C. (2002) Detection and differentiation of serologically crossreacting tobamoviruses of economical importance by RT-PCR and RT-PCR-RFLP. J. Virol. Methods 106, 1-10. Lirong C. M. Z. G. J, and Jiyan Q. (1986) Meristem-tip culture and value of application of virus-free clone in Chinese artichoke. Acta Agric. Bor. Sin 2, 15-22. Mueller E. E, and Grau C. R. (2007) Seasonal progression, symptom development, and yield effects of Alfalfa mosaic virus epidemics on soybean in Wisconsin. Plant Dis 91, 266-272. Owen J, and Palukaitis P. (1988) Characterization of Cucumber mosaic virus I. Molecular heterogeneity mapping of RNA 3 in eight CMV strains. Virology 166, 495-502. Palukaitis P, and García-Arenal F. (2003) Cucumoviruses. Adv. Virus Res 62, 241-323. Taylor R. H, Grogan R. G, and Kimble K. A. (1961) Transmission of tobacco mosaic viras in tomato seed. Phytopathology 51, 837-42. Untiveros M, Perez-Egusquiza Z, and Clover G. (2010) PCR assays for the detection of members of the genus Ilarvirus and family Bromoviridae. J. Virol. Methods 165, 97-104. Zheng L, Rodoni B. C, Gibbs M. J, and Gibbs A. J. (2010) A novel pair of universal primers for the detection of potyviruses. Plant Pathol 59, 211-220.